it is night. a marble. a enormous forest green rope is 50 feet behind and 50 feet left of the marble. a 10 foot tall blue lightbulb is on the rope. the lightbulb's filament is white. its element is white. a azure light is -2 feet above and -1 foot in front of the lightbulb. a 10 foot tall red lightbulb is right of and behind the blue lightbulb.its filament is white. its element is white. a pink light is -2 feet above and -1 foot in front of the lightbulb. a 10 foot tall green lightbulb is left of and behind the blue lightbulb. its filament is white. its element is white. a lime light is -2 feet above and -1 foot in front of the lightbulb. a 10 foot tall yellow lightbulb is left of the green lightbulb. its filament is white. its element is white. a lemon light is -2 feet above and -1 foot in front of the lightbulb. a 10 foot tall white lightbulb is in front of the blue lightbulb. its filament is white. its element is white. a cream light is -2 feet above and -1 foot in front of the lightbulb. ground is 200 foot wide [christmas]. ambient light is gold. a santa claus. a 5 foot tall woman is -.85 foot left of and -1.7 foot behind the santa claus. her robe is maroon. her trim is white. her hair is white. a large [brick] fireplace is behind and -4 feet right of them. a very huge wall is behind the fireplace. the wall is 5 foot tall [wood]. a large camera is 6.2 feet in front of and -2 foot above and -2.5 foot left of the woman. a 1st 3 foot tall christmas tree is on the fireplace. a 2nd 2 foot tall christmas tree is right of the 1st christmas tree. a 3rd 2 foot tall christmas tree is left of the 1st christmas tree. 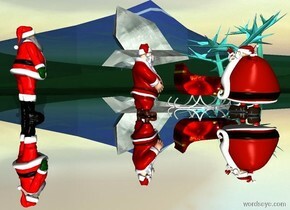 a 4th christmas tree is right of the santa claus. an elf is -5 feet above and -2 foot left of the tree. the elf leans 45 degrees to the right. camera light is black. a linen light is behind and -.5 foot right of and -.3 foot above the camera. ambient light is dim beige rose. a small gold "Merry Christmas" is above the first christmas tree. 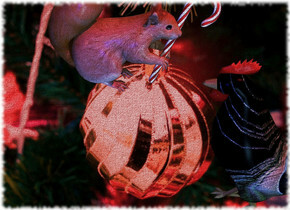 a Christmas backdrop.a squirrel leans 15 degrees to the front. a candy cane is -.2 feet right of and -.3 feet in front of the squirrel.it leans to the front. a peacock chicken is -2.5 feet above and .1 feet in front of the squirrel. it faces back. the sun's azimuth is 210 degrees. the sun is red.the sun's altitude is 58 degrees.the camera light is dim. a blue light is 1 feet left of the squirrel. a fjord blue light is 2 feet left of the chicken. 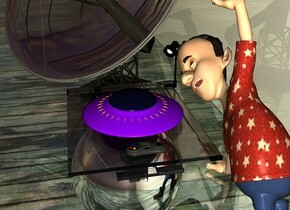 a clear table.a 2 feet tall silver sphere is -24 inches in front of the table.a 6 inches tall flying saucer is on the table.a gamepad is 1 inches right of the flying saucer.the gamepad is facing right.a clear satellite dish is left of the table.a boy is 1 inches behind the table.the satellite dish is facing southeast.shiny ground.the ground is wood.a flat wall is 5 inches behind the boy.the wall is 60 feet long.the wall is shiny.it is dawn.the boy's shirt is [pattern].the [pattern] is 0.2 feet tall. a 1st elf.a large head is -8 inches above the 1st elf.the head is -22 inches behind the 1st elf.the head's iris is red.the head's hair is orange.a 2nd elf is 6 inches left of the 1st elf.a 3rd elf is 6 inches right of the 1st elf.the 2nd elf is facing southeast.the 3rd elf is facing southwest.a 1st flat wall is behind the 1st elf.the ground is silver.the 1st wall is [mountain].the 1st wall is 1 inches in the ground.a 2nd clear flat wall is 1 feet in front of the 1st elf.the sky is [christmas].the [christmas] is 1000 feet tall. 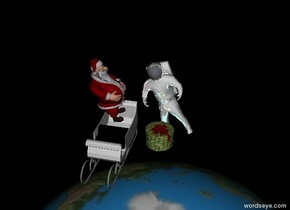 The beginning of the Santa Claus war! a silver part.a 1st man is -1.5 inches above the part.a 2nd man is 4 feet in front of the 1st man.the 2nd man is facing the 1st man.a sleigh is 3 feet right of the 2nd man.the sleigh is [christmas].a 3rd man is 5 feet behind the 1st man.the 3rd man is facing the sleigh. 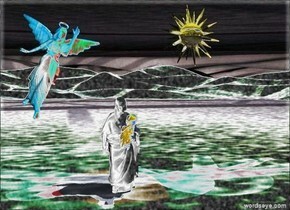 a 10 feet tall silver blossom.a man is 1 feet left of the blossom.the man is facing the blossom.the man is leaning 45 degrees to the east.a flat silver wall is 1 feet left of the man.the wall is facing right.it is noon.a deer is -3 inches in front of the man.the deer is facing the man.a elf is right of the deer.the elf is facing the man. Come See Santa and his Reindeer! The ground is a shiny pansy orange. There is a magenta Santa Claus. 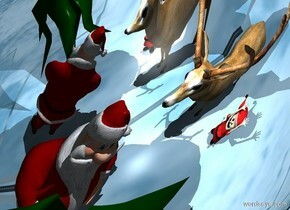 There are six brown reindeer in front of Santa. There is a solid black sleigh to the right of Santa. There is a lime green desk 20 feet in front of Santa. There is a door 10 feet behind the desk. the door is 8 feet tall. There is a wall 8 feet behind Santa. The wall faces Santa. There is a wall 8 feet to the right of Santa.The wall faces Santa. There is a wall 8 feet to the left of Santa. The wall faces Santa. There is a wall that is 7.5 feet wide to the right of the door. The wall faces the front. There is a wall that is 7.5 feet wide to the left of the door. The wall faces the front. There is a woman behind the desk. The red "WELCOME TO THE NORTH POLE!!!" is 1 foot above the woman. The black "well... as north as it gets, that is" is to the right of the woman. a first pair.the first pair are face up.the first pair are 8 inches above the ground.a 2 feet tall first box is in front of the pair.the first box is on the ground.a second pair is 6 inches behind the first pair.the second pair are face down.a second 2 feet tall box is behind the second pair.the second box is on the ground.the ground is shiny.a christmas tree is 1 feet left of the first box.a 30 feet long wall is 2 inches left of the tree.the wall is facing right.the ground is tile.the wall is wood. a [dirt] river. a donkey is -34 feet to the front of and -2 feet above the river. the donkey faces west. 1st linen statue is -3 feet above the donkey. the statue faces west. the foot of the 1st statue is brown. the hair of the statue is tan. the head of the statue is tan. the robe of the statue is tan. 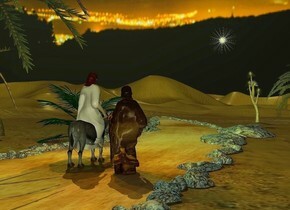 a 2nd dull [night] statue is 1 feet behind and -3 feet to the right of the donkey. the foot of the 2nd statue is brown. the 2nd statue faces to the southwest. 1st palm tree is 2 feet in front of the donkey. 2nd palm tree is 5 feet west of and 3 feet in front of the donkey. 3rd small palm tree is 45 feet west of and 3 feet behind the 2nd statue. a large joshua tree is 12 feet west of and 2 feet in front of the 3rd palm tree. a large white sun symbol is 5 feet above and 2 feet to the front of the joshua tree. the azimuth of the sun is 240 degrees. the sky is [night]. the sun is sage green. the camera light is sage green. 2 dim orange lights are 4 inches above the 1st statue. 2 dim green lights are 3 inches above the 2nd palm tree. 1st 6 feet long and 2 feet tall and 4 feet deep tile square. 1st 12 feet tall and 6 feet long [holiday] wall is behind the square. a small shiny wreath is -8 feet above and 0.2 feet in front of the 1st wall. it leans 45 degrees to the front. a green light is on the wreath. a woman is 2 feet in front of the wall and on the square. the woman is [Christmas]. the skirt of the woman is [Christmas]. 2nd 14 feet tall and 30 feet long clear wall is -0.2 feet right of the 1st wall. it faces left. 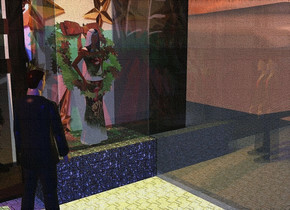 a 14 feet tall clear door is left of the square. 3rd 40 feet long and 15 feet tall [retail] wall is 4 feet behind the door. the ground is stone. 2nd 6 feet long and 2 feet tall and 4 feet deep tile square is above the 1st wall. a red light is on the woman. 3 dim orange lights are 6 inches in front of the woman. 6 dim rust lights are -2 feet above and 1 feet in front of the woman. a chartreuse light is -1.5 feet above and 11 inches in front of the woman. a man is -0.2 feet left of and 0.5 feet in front of the 1st square. he faces the woman. the ground is tile. 4th clear 6 feet long and 14 feet tall and 0.1 inch thick wall is above and -0.7 feet to the front of the 1st square. 5th 3 feet long and 12 feet tall and 0.1 inch thick clear wall is -0.9 feet left of and -0.1 feet above the 1st square. it faces right. the camera light is blue. the sun is coral. the ambient light is baby blue. a dim linen light is on the woman. a bed. the blanket of the bed is [stars]. the pillow of the bed is sage green. a man is -5.1 feet above and -4.1 feet right of the bed. he faces southwest. he leans 65 degrees to the northeast. the shirt of the man is [pattern]. a woman is -5.4 feet above and -4.6 feet left of the bed. she faces southeast. she leans 63 degrees to the northwest. a 50 feet wide and 15 feet tall wood wall is behind the bed. a louvered door is 3.5 feet left of the bed. it faces right. 1st stand is -6 inches left of the bed and 5 inches in front of the wall. 2nd stand is -6 inches right of the bed and 5 inches in front of the wall. the sun is dim. 2nd 3 feet tall and 10 feet long wall is above the door. It faces right. 6 light blue lights are 5 inches left of and 3 inches above the door. the camera light is black. a thought bubble is -0.8 feet above the man. the ground is tile. 1st silver gingerbread man is in the thought bubble. 2nd silver gingerbread man is -0.2 feet right of the 1st gingerbread man. 12 dim lilac lights are 2 inches in front of the 1st gingerbread man. the ambient light is purple. 1st lamp is on the 2nd stand. a 0.9 feet tall shiny santa claus is left of the 1st gingerbread man. he faces southeast. he leans 8 degrees to the right. 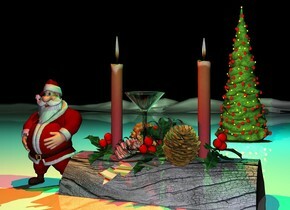 3 dim lavender lights are 2 inches in front of the santa claus. 2nd lamp is on the 1st stand. a phone is -3 inches right of the 2nd lamp. a alarm clock is -2 inches left of the 1st lamp. it faces southwest. 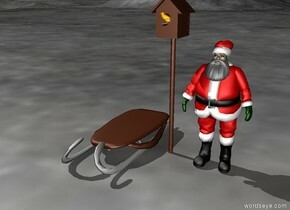 1st 0.7 feet tall red sleigh is 1 feet right of the 2nd 0.7 feet tall red sleigh. the runner of the 1st sleigh is gold. the runner of the 2nd sleigh is gold. a polar bear is -0.5 feet above and -5 feet left of and -2 feet to the front of the 2nd sleigh. 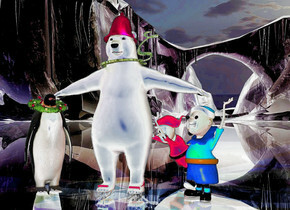 a large [texture] bell is -0.7 feet above the polar bear. it leans 11 degrees to the back. a [texture] sigma is -1.6 feet above and -2.45 feet to the front of the polar bear. it faces right. it leans 83 degrees to the front. a [texture] zeta is -0.3 feet to the right of and -0.16 feet above and -2 feet to the front of the sigma. it leans 34 degrees to the back. 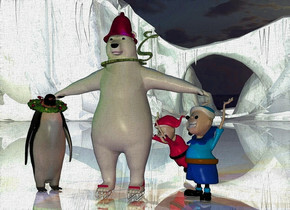 a 4.8 feet tall penguin is -1.6 feet to the left of and -3.55 feet to the front of the polar bear. it is on the ground. it faces southeast. 1st 4.5 feet tall elf is 4.7 feet to the right of the penguin. he faces southwest. 2nd 4.5 feet tall elf is 2 inches behind and -2 feet to the left of the 1st elf. he faces southwest. he leans 43 degrees to the front. a wreath is -1.1 feet above the penguin. it faces southeast. it leans 71 degrees to the back.the ground is shiny snow. the sun is dim. the camera light is sage green. 2 dim green lights are 4 inches above the penguin. 2 dim blue lights are on the polar bear. a dim violet light is -0.55 feet above the 1st sleigh. a magenta light is -0.55 feet above the 2nd sleigh. a dim orange light is on the 2nd elf. a dim lavender light is 4 inches in front of the penguin. 2 dim purple lights are 2 feet in front of the 1st elf. 1st 18 feet tall and 70 feet long [pattern] wall. 2nd 13 feet tall and 30 feet long [pattern] wall is 8 feet in front of and -30 feet left of the 1st wall. 3rd 5 feet tall and 5 feet wide [pattern] wall is -0.1 feet right of and -5 feet above the 2nd wall. 4th 13 feet tall and 30 feet long [pattern] wall is right of and -13 feet above the 3rd wall.the ground is [parquet]. a miniature cherry tree is -5.8 feet above and 0.5 feet in front of the 3rd wall. it is upside down. a red xi is -5.3 feet above and 0.2 feet to the front of the 3rd wall. it leans 30 degrees to the right. a large bell is -0.3 feet above the tree. a 6.2 feet tall woman is -13 feet above and -1 feet to the back of and -2.6 feet right of the 3rd wall. she faces southwest. a 6 feet tall man is -0.3 feet left of the woman. he faces the woman. the shirt of the man is [skyline]. a large chandelier is 9 feet in front of and -5 feet to the left of and -5 feet above the 4th wall. the azimuth of the sun is 220 degrees. the sun is dim. a small elf is -5.47 feet above and -1.7 feet to the right of the chandelier. the shirt of the elf is [Christmas]. it faces left. it leans to the front. a large mirror is -10.7 feet above and 0.1 feet to the front of and -6 feet left of the 4th wall. a large Christmas tree is 6 feet in front of the elf and on the ground.a 15 feet tall and 30 feet long [pattern] wall is 3 feet in front of the tree. a dim light is -6 inches above and 6 inches behind the tree. 2 dim orange lights are -0.2 feet above the lamp of the chandelier. the camera light is dim copper. a old gold light is 0.3 feet behind and -4 feet above the 3rd wall. a 6.5 feet tall santa claus is 0.5 feet in front of and -1 feet right of the tree. he faces back. a 2.5 feet tall bench is 5.5 feet behind and -4 feet right of the woman. the cushion of the bench is [pattern]. 2 dim magenta lights are 0.3 feet above the elf. a wreath is -12.5 feet above and 0.3 feet in front of the 1st wall. it is -3 feet right of the woman. 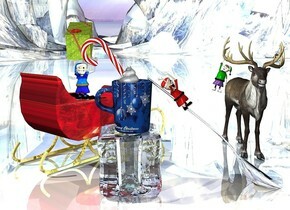 a very huge [Christmas] mug is -0.2 feet above and -4.6 feet to the right of the 4.5 feet tall ice cube. the ice cube is on the ground.the mug faces right. a 1.4 feet tall silver spoon is -1 feet right of the ice cube. it faces left. it leans 45 degrees to the back. a large white poop is -0.1 feet above and -2.4 feet to the right of the mug. it faces back. a very huge candy cane is -3.1 feet above and -5.2 feet to the right of the mug. it leans 33 degrees to the front. it faces left. 1st elf is -3.7 feet above and -3.7 feet to the left of the spoon. he faces southeast. he leans 37 degrees to the northeast. 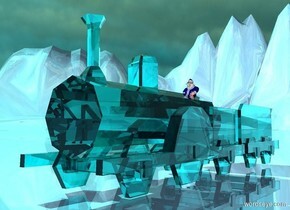 a large [texture] sleigh is behind and -7 feet left of the ice cube. it faces northeast. the runner of the sleigh is gold. 2nd elf is -9 feet to the right of and -1.7 feet above and -0.9 feet to the front of the sleigh. 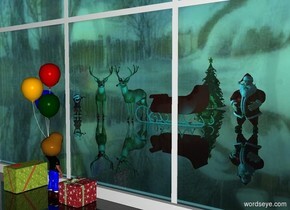 a 11 feet tall reindeer is 4 feet behind and -5 feet right of the spoon. it is on the ground. 3rd elf is -5 feet above and -3 feet left of and -1 feet to the front of the reindeer. he leans 17 degrees to the left. the shirt of the 3rd elf is green. a large gift is -0.01 feet above the 2nd elf. it leans front. a dim light is 1 inch above and 1 inch in front of the poop. the ground is shiny [snow]. 2 dim beige lights are 2 inches in front of and -3 inches above the reindeer. 3 dim turquoise lights are -0.8 feet above the ice cube. a dim sky blue light is 0.3 inches above the poop. a [wood] door. 1st 12 feet tall and 10 feet long and .2 inch deep [pattern] wall is left of the door. 2nd and 5.3 feet tall and 7 feet long and .2 inch deep [pattern] wall is above the door. 3rd 12 feet tall and 10 feet long and .2 feet deep [pattern] wall is -0.1 feet to the right of the door. 4th 12 feet tall and 10 feet long [pattern] wall is in front of and -0.8 inches right of the 3rd wall . it faces left. a 6 feet tall [wood] bureau is -4 feet right of and 0.2 feet in front of the 1st wall. 1st large bell is -0.6 feet above and -0.6 feet right of the door. it faces left. 2nd small wreath is 2.6 feet left of and 0.1 feet in front of the 1st bell. 3rd large bell is 5.5 feet left of the 1st bell. it faces left. a 1.2 feet tall elf is -2.3 feet left of and -0.1 inch above the bureau. the ground is tile. a Christmas tree is in front of and -4 feet left of the 3rd wall. a [feather] ottoman is 1 feet in front of and 7 feet left of the tree. it faces southeast. a [feather] chair is -2 feet left of and -1 feet to the back of the ottoman. it faces southeast. a small boy is -0.01 feet above and -4.1 feet to the right of and -3.8 feet to the front of the ottoman. he faces southwest. the shirt of the boy is [texture]. 1st gift is -0.1 feet southwest of the tree. 2nd gift is 0.1 feet in back of the 1st gift. it faces southeast. 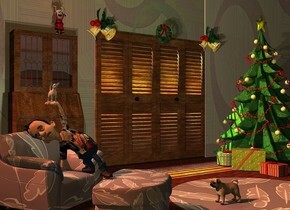 3rd gift is -0.3 feet left of the tree.a small white chihuahua is -0.04 feet above and -1.8 feet to the right of the boy. a 6 feet wide [feather] circle is 0.2 feet right of the ottoman and -0.2 inches above the ground. a pug is -2 feet left of and on the circle. he faces the boy. 6 yellow lights are 3 inches in back of and 3 inches above the door. the sun is dim coral. the camera light is dim orange. 1 dim rust light is 1 inch above the elf. 2 dim beige lights are 2 inches right of the chihuahua. 1 dim green light is 2 inches above the wreath. a clear cyan toy.shiny forget me not blue ground.the ground is 200 feet tall. [storm]sky.a 1 inch tall man is -2 inches above the toy.the sun is aquamarine.the man is navy. a 20 feet wide window.clear ground. [winter]sky.a boy is in front of the window.the boy is facing the window.a man is 20 feet behind the boy.a sleigh is 2 feet left of the man.the sleigh is facing left.the sleigh is red.a first animal is left of the sleigh.a second animal is 6 inches left of the first animal.the second animal is facing southeast.a elf is left of the second animal.the elf is facing the boy.a christmas tree is 15 feet behind the first animal.a first box is left of the boy.a second box is right of the boy.a cyan light is 4 feet in front of the sleigh. a large fountain. 1st 74 feet long and 30 feet tall and 1 inch thick [rot] wall is 60 feet in front of the fountain. 2nd 75 feet long and 40 feet tall and 1 inch thick clear wall is 10 feet in front of the fountain.the 2nd wall leans 20 degrees to the back. 3 gray lights are behind the 1st wall. 3rd 45 feet tall and 75 feet long and 1 inch thick [rot] wall is 0.2 feet behind and -4 feet above the 1st wall. the 3rd wall leans 40 degrees to the back. a light is behind the 3rd wall. the camera light is dim. the sun is gray. the ground is [snow]. the rim of the fountain is transparent red. a sage green light is 6 inches above the fountain. the interior of the fountain is stone. the pole of the fountain is gold. the ball of the fountain is clear. the exterior of the fountain is tile. 1 chartreuse light is 6 inches in front of and -7 feet above the fountain. 1 turquoise light is 6 inches behind and -4 feet above the fountain. a very large clear cyan octopus is -5.2 feet above the fountain. a very large elf is 2 feet behind and 2 feet right of the fountain. 1st large caribou is 2 feet behind and 3 feet left of the elf. it faces the elf. 2nd large caribou is 0.5 feet left of and 1.5 feet behind the fountain. it faces the elf. a very large gold handbell is .5 feet above and -0.7 feet to the left of and -0.8 feet to the front of the elf. it leans 95 degrees to the left. the handle of the handbell is wood. 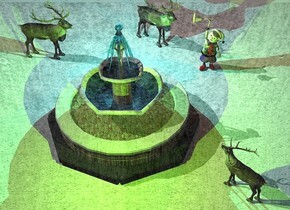 3rd 9.25 feet tall caribou is -0.2 feet right of and -3.7 feet to the front of the fountain. it faces the northwest. a dim rust light is 3 inches above the handbell. the shirt of the elf is [Christmas]. the shoe of the elf is red. a giant [present] pumpkin is 4 feet above the ground. a elf is -2 feet above the pumpkin. it faces southeast. a present is -0.2 feet above the elf. a 20 feet tall tan hand faces back. it is -6.6 feet above and -11.4 feet to the right of and -9 feet to the front of the pumpkin.it leans 90 degrees to the right. the nail of the hand is red. 1st 3.5 feet tall Christmas ornament is -1.8 feet left of and 0.1 feet in front of and -5.9 feet above the pumpkin. it leans 40 degrees to the right. 2nd 16 feet tall matte [Christmas] Christmas ornament is -14.6 feet to the right of and 3 feet behind and 0.3 feet above the pumpkin. a large bell is 1.4 feet to the front of and -3.1 feet above and 0.8 feet left of the pumpkin. it leans right. a 20 feet tall [stone] fireplace is 6 feet behind the hand and on the ground. a 8 feet tall Christmas stocking is 0.01 feet to the front of and -8.7 feet above and -14 feet to the right of the fireplace. the interior of the fireplace is [brick]. the grate of the fireplace is [metal]. a giant fire is -1 feet behind the grate of the fireplace. a huge Christmas tree is left of and 0.5 feet behind the hand. it is -0.5 feet above the ground. 2 orange lights are -8 inches above the fire. 2 copper lights are 2 inches to the right of the orange lights. a 60 feet tall and 80 feet wide [tile] wall is behind the fireplace. the ground is [tile]. the camera light is dim turquoise. the sun is dim rust. 3 dim chartreuse lights are -2 inches above and 2 inches to the front of the elf. a dim sage green light is 3 inches in front of the Christmas stocking. the sun's azimuth is 220 degrees. the sun's altitude is 78 degrees. 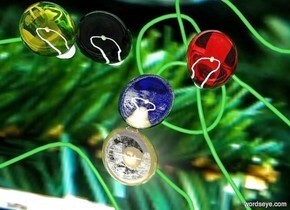 a dim blue light is 2 inches to the front of the 2nd Christmas ornament. The ground is fire. There is a HUGE HUGE HUGE Rat. There is a crown on the HUGE HUGE HUGE rat. There are huge flames behind the rat. [trump] is on the wall behind the rat. 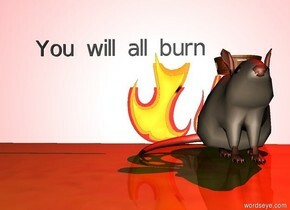 the very small black "You will all burn" is above the HUGE HUGE HUGE Rat. The huge red Light is above the HUGE HUGE HUGE Rat. It is night. a gorilla is on a beach. an elf is on the left behind the gorilla. On the left of the elf is a christmas tree. 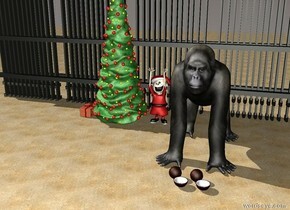 In front of the gorilla are coconuts.behind the christmas tree is a huge fence. on the left side of the christmas tree is a present. A Christmas tree next to a fireplace. The Christmas tree is 7 foot tall. The fireplace is 4 foot tall. The fireplace is brick. There are 8 tiny people on top of the fireplace. 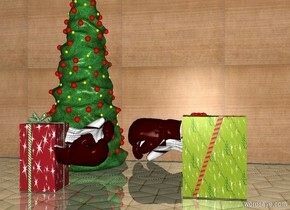 There are 4 large presents next to the Christmas tree. 1 large present is to the right of the Christmas tree. The Christmas tree is 2 foot away from the fireplace. The leather sofa is in front of the fireplace. 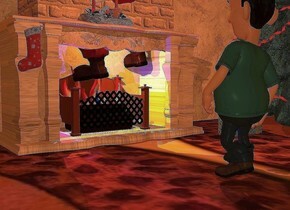 The leather sofa is facing the fireplace. The leather sofa is 12 foot away from the fireplace. There is a fur rug. The fur rug is in front of the fireplace. There is a television above the fireplace. The ground is carpet. 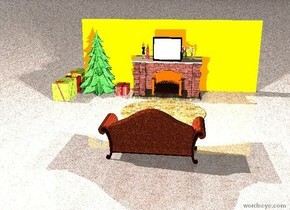 There is a light orange wall behind the fireplace. There are 2 lights above the leather sofa. Green christmas with a snowman! It is winter. The ground is green. There is a big Christmas Tree. Left of the tree are children. Left of the children is a snowman. Behind the tree is a small school. right of the school is a shelter. there is "Merry Christmas" two feet under the tree. 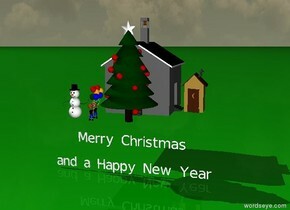 There is "and a Happy New Year" two feet under "Merry Christmas". 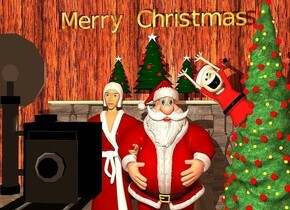 the speech bubble is above santa. it is right of santa. 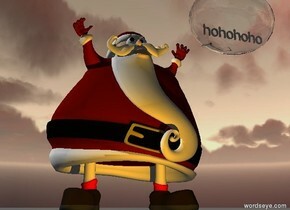 the bright tiny "hohohoho" is in the speech bubble. the orange light is on the ground. it is 12 inches in front of santa. the camera light is black. the small martini glass is on the yule log. the very tiny santa is next to the log. the shiny mountain range is white. the tiny christmas tree is three feet behind the log. it is night. the green light is above the log. the red light is above the santa. a cyan light is above the tree. Houses stand on a white terrain. A big Christmas Tree stands two feet in front of the houses. There is a big snowman two feet right of the tree. 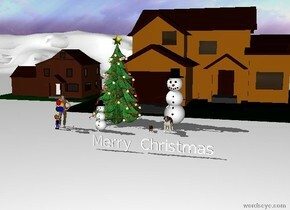 There is a dog two feet in front of the snowman. There is a cat two feet left of the dog. There is a snowman two feet in front of the tree. 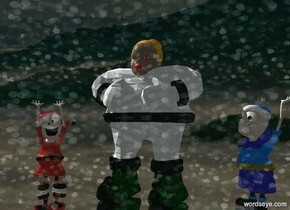 Two children stand four feet left of the snowman. There is a baby one foot right of the children. "Merry Christmas" is ten feet in front of the dog. water is on the ground. The small snowman is 5 inches in the water. The snowman is leaning 12 degrees to the left. The ground is snow. The tiny deer is next to the nose of the snowman. 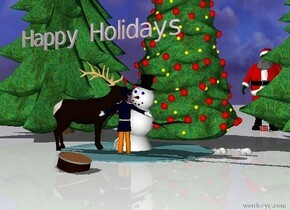 The deer is facing the snowman. The deer is on the ground. The christmas tree is behind the water. The first tree is next to the christmas tree. The second tree is to the right of the christmas tree. The first mouse is to the right of the water. The first mouse is facing the snowman. The second mouse is to the back of first mouse. The second mouse is -1 inches to the right of the first mouse. The second mouse is facing the snowman. Small santa is 5 feet behind the water. Santa is -5 inches right of the water. The tiny human is in front of the snowman. The human is facing the snowman. The human is 1 inches in the ground. The tiny drum is 16 inches in front of the human. The drum is 7.2 inches in the ground. The drum is leaning 15 degrees to the left. The tiny present is in front of the santa. The present is on the ground. Tiny "Happy Holidays" is 4 inches above the deer. 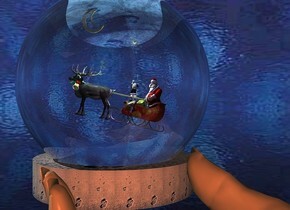 "Happy Holidays" has a glass texture. the gift. 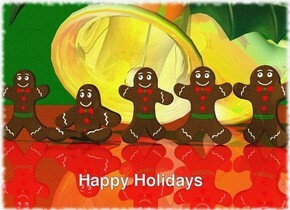 the gingerbread man is on the gift. a large mondrian pinecone is 8 inches left of the gift. the ornament is in front of the gift. the ground is purple. the sky is coral. 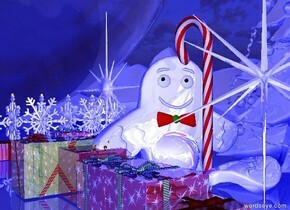 a cyan light is above the gingerbread man. a yellow light is above the pinecone. 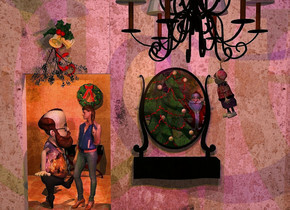 a mirror is two feet behind the gift.